This is a list of Federation starships from the fictional Star Trek universe. The list is organized first by ship class, then registration number, name, and finally where that vessel was referenced. These vessels appear or are mentioned in the original Star Trek series (TOS), Star Trek: The Next Generation (TNG), Star Trek: Deep Space Nine (DS9), Star Trek: Voyager (VOY), Star Trek: Enterprise (ENT), Star Trek: Discovery (DIS), the Star Trek films, Star Trek games, and Star Trek literature. This list tries to avoid using information found in Star Trek fan fiction. Many of the sources for this list are considered non-canon and the list relies heavily on the non-canon The Star Trek Encyclopedia. USS Gryphon NCC-65550 Commanded by Captain Elaine Mello. Assigned to defend Deep Space Nine for a short period of time after the Dominion War in the Deep Space Nine relaunch. USS James T Kirk NCC-91277 Commanded by Captain Elias Vaughn. Named in honor of the famous Starfleet captain. Destroyed in the defense of Federation worlds against the mass Borg invasion of 2381, resulting in the death of 31 crew members and Captain Vaughn being left brain dead. USS Rabin NCC-63293 Participates in the Battle of Sector 001. USS Thunderchild NCC-63549 Participates in the Battle of Sector 001 in 2373. USS Geronimo NCC-69302 Commanded by Captain Gregory McCray; Major supporting ship in Star Trek: Bridge Commander. USS Leyte Gulf NCC-71427 Commanded by Captain Aaron Juraj; first Starfleet vessel to be infected by nanites in Star Trek: Away Team. USS Dakota NCC-63892 Participates in the Battle of Sector 001 in 2373. Lost patrolling the border of the Cardassian Demilitarized Zone. USS Devore NCC-64088 Commanded by Captain Joshua Martin; Supporting ship in Star Trek: Bridge Commander. USS Delestrez NCC-64013 Commanded by Captain Juliette; Supporting ship in Celestia Universe. USS Summit NCC-63546 Attempts to rescue the Enterprise-E on Gemworld. Destroyed by a dimensional rift immediately after dropping out of warp. Lost with all hands. USS Adelphi NCC-26849 Crew made first contact with the Ghorusda. USS Enterprise NCC-1701-C Commanded by Captain Rachel Garrett presumed to be Killed In Action when the ship was destroyed defending the Klingon outpost at Narendra III from Romulan attack. Helmsman Richard Castillo assumed command of the Enterprise-C in 2366 and returned to the year 2344 where the ship was destroyed defending the Klingon outpost. USS Excalibur NCC-26517 Part of the tachyon blockade during the Klingon Civil War. Later commanded by Captain Mackenzie Calhoun in Star Trek: New Frontier. USS Exeter NCC-26531 Tom Paris's assignment before being dismissed from Starfleet. Participated in the Dominion War. Later commanded by Captain Elizabeth Shelby, followed by Captain Alexandra Garbeck in Star Trek: New Frontier. USS Gandhi NCC-26632 Ship to which Thomas Riker is assigned. USS Horatio NCC-10532 Commanded by Captain Walker Keel. Destroyed by agents of an alien conspiracy to take over Starfleet. USS Valdemar NCC-26198 Sent to the border of the Cardassian Demilitarized Zone. USS Yamaguchi NCC-26510 Destroyed by the Borg at the Battle of Wolf 359. USS Zhukov NCC-26136 Made cultural observation of Alpha Laputa IV. Previous assignment of Lt. Barclay before transfer to the Enterprise-D Supporting ship in Star Trek: Bridge Commander, commanded by an Andorian Captain Verata, the ship escorts the USS Sovereign to Starbase 12 and participates in several battles. USS Loma Prieta NCC-25661 Flagship of Admiral T’Nae during Sela's assault on Vulcan in 2408. Named for Greek mythological figure and nearby Andromeda galaxy. USS Drake NCC-70956 Ambushed by a Klingon battle squadron. USS Prokofiev NCC-68814 Dispatched to the border of the Federation–Cardassian Demilitarized Zone. USS Antares aka SS Antares NCC-501 Rescued and is later destroyed by Charlie Evans. USS Hermes NCC-10376 Part of the tachyon blockade during the Klingon Civil War. Named for the ancient Greek solar deity and the American Apollo program (NASA). USS Ajax NCC-11574 Cortin Zweller's first assignment. Received experimental warp drive technology. Part of the tachyon blockade during the Klingon Civil War. USS Clement NCC-12537 Scheduled to rendezvous with the Enterprise-D.
USS Gage NCC-11672 Destroyed at the Battle of Wolf 359. Scout ship introduced in the Star Trek: The Original Series tie-in novel series Star Trek: Vanguard and its follow-up Star Trek: Seekers. Retroactively named after Captain Jonathan Archer from Star Trek: Enterprise. USS Huang Zhong NX-45298 Mentioned in the tie-in novel Star Trek: Seekers #4: All That's Left. Crashed on a planet in a spatial rift. Crew rescued by the Enterprise resulting in first contact with the Dolysians. USS Sagittarius NCC-1894 Commanded by Clark Terrell prior to taking command of the USS Reliant. Assigned to explore the Taurus Reach. Presumably named for the constellation. Name honors science fiction author Ray Bradbury. USS Bradbury NX-72307 Scheduled to transport Wesley Crusher to Starfleet Academy and undergoes warp drive performance tests. In Star Trek Into Darkness, Spock was to be reassigned to another Bradbury following Kirk's demotion from Captain of the Enterprise. In the end, he was reinstated to the Enterprise. USS Centaur NCC-42043 Centaur class: kitbash of the Excelsior and Miranda models. USS Armstrong NCC-57537 Ambushed by a Klingon battle group. Name honors astronaut Neil Armstrong, commander of Apollo 11. USS Buran NCC-57580 Destroyed at the Battle of Wolf 359. USS Kearsarge NCC-57566 Rendezvoused with the Enterprise-D.
USS Ahwahnee NCC-71620/NCC-73620 Heavily damaged at the Battle of Wolf 359. Presumed repaired to participate in the tachyon blockade during the Klingon Civil War. Named for the mythical chimaera. USS Portland NCC-57418 Searches the Algira sector for Odo and Elim Garak when their runabout goes missing. USS Endeavour NCC-06 Originally the last active NX class starship in the Earth Starfleet. Transferred to Federation Starfleet service and rebuilt into the first Columbia class starship. In the script of the TNG Episode "The Battle," Geordi La Forge identified the Stargazer as a Constitution Class, but it was dubbed to Constellation after the script was changed. USS Billings NCC-3907 Kathryn Janeway's first command. USS Constellation NCC-1974 Participated in the Dominion War. USS Gettysburg NCC-3890 Under Captain Mark Jameson, rescued hostages from Mordan IV. Served in the Dominion War. USS Hathaway NCC-2593 Decommissioned, participated in exercises against the USS Enterprise-D. Its destruction was faked in a ruse to foil Ferengi attackers. Named for the wife of William Shakespeare. USS Stargazer NCC-2893 Jean-Luc Picard's first command. Abandoned following the Battle of Maxia, later recovered by Starfleet. USS Constellation NCC-1017 Commanded by Commodore Matthew Decker. All of crew was killed by the Doomsday Machine except for Commodore Decker. Used as a bomb to destroy the planet-killer. USS Defiant NCC-1764 The ship is lost in an interdimensional rift in "The Tholian Web". Later, it is revealed she was taken by Mirror Universe Tholians, captured by the crew of ISS Enterprise (NX-01), and then used in the service of the Terran Empire in "In a Mirror, Darkly". In Star Trek Continues (episode 8, "Still Treads the Shadow"), Defiant is duplicated during its passage through the interdimensional rift into interphasic space with only a duplicate Kirk aboard. Over the next two hundred years, it gains a sentient AI who attempts to bring it back into the prime universe. The attempt has potentially disastrous consequences and is foiled by both Kirks, the duplicate returning to interphasic space. A Defiant is mentioned, but not seen (except for a wireframe graphic) in Star Trek Discovery, Season One. ISS Enterprise NCC-1701 Mirror Universe version of the USS Enterprise in "Mirror, Mirror". USS Enterprise NCC-1701 Commanded by Robert April (2245–2250), Christopher Pike (2250–2265), James T. Kirk (2265-2270, 2273–2280, 2285), Willard Decker (2270-2273, ship's commander during refit up to V'Ger incident), and Spock (2280-2285, at which time Enterprise was assigned to Starfleet Academy as a training ship). Vessel's self-destruction carried out while in orbit of the Genesis Planet to prevent ship from falling into Klingon hands. 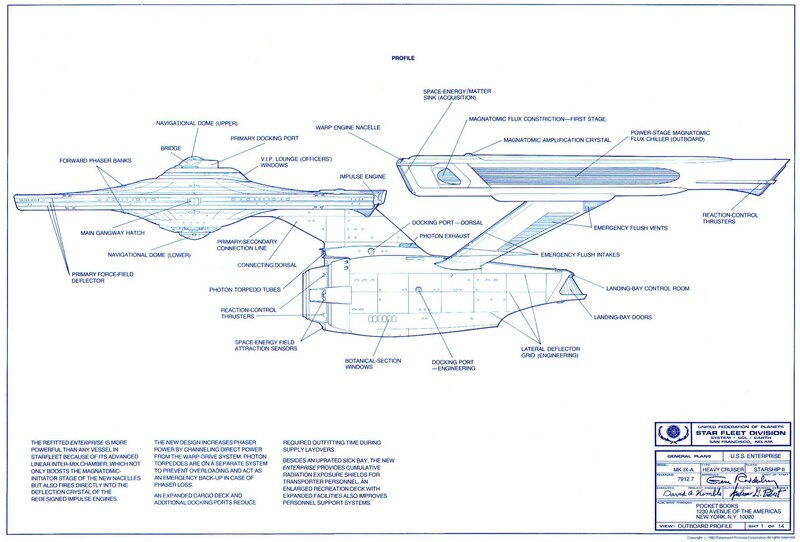 USS Enterprise (Kelvin Timeline) NCC-1701 Originally commanded by Christopher Pike (launched 2258), then James T. Kirk. Destroyed by Krall in 2263. USS Excalibur NCC-1664 Severely damaged and crew killed during Richard Daystrom's M5 computer test. USS Exeter NCC-1672 All crew lost (killed by alien disease) except for Captain Ronald Tracey, who was on the planet's surface when the disease struck his crew. See Kongo for its ultimate fate. USS Farragut NCC-1647 Ship on which James Kirk served as a phaser station operator. Attacked by the dikironium cloud creature, which killed half the crew. The ship never appeared on screen and was never given a class or registry number; both come from The Star Trek Encyclopedia. USS Hood NCC-1703 Participates in Richard Daystrom's M5 computer test. Destroyed by sabotage in Star Trek Continues episode 7, "Embracing the Winds". In episodes 10–11 "To Boldly Go", we find out this was done by espers. USS Intrepid NCC-1631 All-Vulcan crew destroyed by a massive, spacegoing single-celled life form. USS Kongo NCC-1710 In Star Trek Continues episodes 10–11 "To Boldly Go", the Kongo is hijacked by espers and taken to the galactic barrier. They then head for Earth with murderous intent. With the help of Romulan commander Charvanek and her Hawk's Talon, the Enterprise foils them, but not before they trick the Exeter and Potemkin into destroying each other. In their last act of defiance, the espers destroy the Kongo. USS Paris NCC-1804 Destroyed in The Battle of Caleb IV. USS Pegasus NCC-1702 Patrolled the Klingon Neutral Zone. USS Potemkin NCC-1657 Participates in Richard Daystrom's M5 computer test. See Kongo for its ultimate fate. USS Republic NCC-1371 Although many reference sources included Republic as a Constitution-class heavy cruiser, its status in canon is, to date, uncertain. Kirk himself stated in the episode "Court Martial" the ship's nomenclature as "United Starship Republic, number 1371". USS Valiant NCC-1623 For his influential "The Case of Jonathan Doe Starship" article, published in the April 1973 issue 27 of the T-Negative fanzine, future Star Trek model maker Greg Jein accepted the producer's intent and endowed Valiant with the appropriately lower conjectural registry number NCC-1623. But unlike many of his other conjectural Constitution-class registry numbers, the 2006 remastered version of the series afforded no opportunity to bring this ship to canon. The reference book Star Fleet Technical Manual also listed a Constitution-class starship with the name Valiant but assigned with the registry NCC-1709. USS Yorktown NCC-1717 Disabled by alien probe. USS Enterprise NCC-1701 USS Enterprise NCC-1701 was refitted following extensive service. with upgraded weapons, shields, sensors, and warp core. Commanded during refit by Captain Willard Decker. Command given to Admiral James T. Kirk after he met with Starfleet Command. Spock handed control over to Kirk. Eventually stolen and destroyed while in orbit of the Genesis Planet to prevent it from falling into Klingon hands. Served as primary vessel for Star Trek: The Motion Picture, Star Trek II: The Wrath of Khan, and Star Trek III: The Search for Spock. Disabled by whale probe, then possibly salvaged and renamed Enterprise; although no onscreen evidence supports this. Command given to James T. Kirk following demotion to Captain. Primary setting for Star Trek V: The Final Frontier and Star Trek VI: The Undiscovered Country, later decommissioned. USS Explorer NCC-1986 Seen investigating the results of the Tabula Rasa Incident in the opening sequence of the video game Star Trek: New Worlds. Commanded by Captain Gibson. Class presumably named for American test pilot Albert Scott Crossfield. USS Discovery NCC-1031 Titular ship in 2017 television series Star Trek: Discovery. Initially commanded by Captain Gabriel Lorca, and later by Captain Christopher Pike, the Discovery is a science vessel commissioned to investigate potential forms of faster-than-light propulsion such as the spore drive. USS Glenn NCC-1030 Sister ship to the Discovery. Scuttled following a failed propulsion experiment. USS Crossfield NCC-1029 Presumable namesake ship for the class. Class named for an iconic figure from Greek mythology. USS Archon NCC-189 Destroyed by alien computer in 2167 near Beta III. USS Essex NCC-173 Damaged and crashed on Mab-Bu VI. USS Pilgrim NCC-178 Active in the year 2159 in the vicinity of one of Starfleet's first starbases. Appears in the Star Trek videogame "Legacy". USS Lovell NCC-470 Dedicated vessel of the Starfleet Corps of Engineers. Appears in the novel series Star Trek: Vanguard. Likely named after Capt. James Lovell USN, Gemini and Apollo astronaut. USS Masao unknown Dedicated vessel of the Starfleet Corps of Engineers. Mentioned in the tie-in novel Star Trek: Seekers #4: All That's Left. USS Zander unknown Dedicated vessel of the Starfleet Corps of Engineers. Mentioned in the tie-in novel Star Trek: Seekers #4: All That's Left. USS Defiant NX-74205 Pathfinder. Assigned to space station Deep Space Nine. Participates in the Battle of Sector 001. Destroyed at the Second Battle of Chin'toka. USS Defiant (dedication plaque) NCC-75633 (exterior) NX-74205 Formerly the USS São Paulo. Assigned to space station Deep Space Nine. Participates in the Battle of Cardassia. USS Saladin NCC-74350 Commanded by Captain Shinoda during the Dominion War in the short story "Safe Harbors". USS Valiant NCC-74210 Starfleet Academy Red Squad training ship. The vessel gets caught behind enemy lines after the outbreak of the Dominion War, suffered heavy losses among the standard crew and was subsequently commanded by the cadets of Red Squad. Destroyed by the Jem'Hadar after a failed attempt to destroy a new Dominion Vessel. Only three people survived the destruction of the ship (Jake Sisko, Nog, and Collins, a member of Red Squad). USS Monitor NCC-75001 Mentioned in both the books The Return and Preserver, lost under command of Captain John Scott Lewinski attempting to set new warp speed record with recovered Borg transwarp drive. USS Eagle Unknown Star Trek Voyager One of two Defiant Class ships assigned to either recover or destroy the NX Prometheus after it was captured by Romulans. Was accidentally fired upon by the EMHs from the USS Voyager and the NX Prometheus. USS Nirvana Unknown Star Trek Voyager One of two Defiant class ships assigned to either recover or destroy the NX Prometheus after it was captured by Romulans. Named for the fictional planet in the TOS Episode "Operation: Annihilate!" USS Arcos NCC-6237 Destroyed by a warp core breach near Turkana IV in 2367. Crew evacuates to the planet's surface and is rescued by the Enterprise-D.
USS LaSalle NCC-6203 Reports unusual radiation anomalies in the Gamma Arigulon system. USS Vengeance NCC-177358 Developed by Starfleet Admiral Alexander Marcus of Section 31 to combat the Klingon Empire. USS Kelvin NCC-0514 In the timeline at the start of the movie Star Trek, the Kelvin was in service with Starfleet in the early 23rd century. In 2233, the Kelvin was under the command of Captain Richard Robau; his first officer was Lieutenant Commander George Kirk. Kirk's wife, Winona, was also aboard the ship at that time while she was pregnant with their son, James T. Kirk. The Kelvin was destroyed by the Romulan mining ship Narada, which arrived from the distant future through an artificial black hole. Named for director J. J. Abrams' grandfather. Its registry number, NCC-0514, comes from Abrams's birthdate of May 14. SS Santa Maria NCC-529 Personnel Transport about 4 times the size of the Runabout. Cannibalised for parts and for use as a shelter by human settlers in a colony that rejects technology. USS Al-Batani NCC-42995 Although it never appeared on screen, the Al-Batani is mentioned in dialogue as the first ship aboard which Kathryn Janeway served, which at the time was captained by Tom Paris' father Owen Paris. Never defined on screen, the class and registry number come from the non-canon Star Trek Encyclopedia. USS Berlin NCC-14232 Patrolled the Romulan Neutral Zone. USS Cairo NCC-42136 Transfers Captain Edward Jellico to the Enterprise-D.
USS Charleston NCC-42285 Transported three previously cryogenically frozen people to Earth. Part of the tachyon blockade during the Klingon Civil War. USS Crazy Horse NCC-50446 Part of Task Force 3 sent to face an anticipated Borg invasion. Set to rendezvous with the Enterprise-D to transfer Rear Admiral Erik Pressman. USS Crockett NCC-38955 Transported Admiral Mitsuya to Deep Space Nine. USS Dallas NCC-2019 Dedication plaque states "Last starship of her class"
USS Enterprise NCC-1701-B Ship aboard which James T. Kirk is lost and presumed dead. First commanded by Captain Jon Harriman. USS Excelsior NCC-2000, previously NX-2000 Pathfinder and transwarp drive testbed. In The Search for Spock, the ship was dubbed 'the great experiment' and was days away from its first test run. It was unexpectedly called into service to stop Admiral Kirk and his crew from stealing the soon to be decommissioned Enterprise. Attempting to use the transwarp drive to bring the ship back to spacedock, the Excelsior was sabotaged by Montgomery Scott and was left inoperable. Following the embarrassing failure, the Excelsior underwent repairs in spacedock before its recommission into active duty. Fails in attempt to rescue Captain James T. Kirk and Dr. Leonard McCoy from Qo'noS. Helps defeat General Chang over Khitomer. Ship aboard which Tuvok serves as science officer. Commanded by Captain Styles in Star Trek III: The Search for Spock and Captain Hikaru Sulu in Star Trek VI: The Undiscovered Country. USS Farragut NCC-2021 Transported several genetically enhanced humans to Deep Space Nine. USS Fearless NCC-14598 Assigned to planetary mapping in the Beta Mahoga system. Received new warp technology Briefly seen in The Next Generation Episode " Where No One Has Gone Before"
USS Fredrickson NCC-42111 Briefly at Utopia Planitia Fleet Yards. Serves in the Dominion War. USS Gorkon NCC-40512 Sent to face a possible Borg invasion. USS Grissom NCC-42857 Assists the Enterprise-D during a contamination problem on Beta Agni II. Name pays tribute to astronaut Gus Grissom, commander of Apollo 1. Destroyed at the Battle of Ricktor Prime. USS Hood NCC-42296 William Riker's assignment before his transfer to the USS Enterprise-D. Part of the tachyon blockade during the Klingon Civil War. Participates in the Battle for Deep Space 9 and First Battle of Chin'toka. Part of Battle Group Omega sent to intercept Reman warship Scimitar. USS Intrepid NCC-38907 Responded to a Klingon distress call from the Khitomer outpost following a Romulan attack. USS Lakota NCC-42768 Commanded by Captain Erika Benteen. Attempts to stop USS Defiant from reaching Earth under the orders of the rogue admiral James Leyton. USS Malinche NCC-38997 Commanded by Captain George Sanders. Patrolled the Cardassian Border before the Dominion War. Severely damaged by the Maquis led by Michael Eddington. Destroyed in 2381 during the Borg Invasion. USS Melbourne NCC-62043 Offered to William Riker to command. Starfleet flagship at the Battle of Wolf 359, where it is destroyed. USS Paris (Simulation ship) NCC-2008 Simulated Excelsior class vessel used by Academy trainees in Star Trek: Starfleet Academy. USS Repulse NCC-2544 Katherine Pulaski's assignment before the USS Enterprise-D. Served in the Dominion War. USS Roosevelt NCC-2573 Destroyed at the Battle of Wolf 359. USS Valley Forge NCC-43305 Damaged by an orbital defense platform at the Battle of Chin'toka. The name may have been supposed to honor the space station that was later simply called ISS. USS Concorde NCC-68711 Assigned near the Romulan Neutral Zone in an alternate timeline. USS Firebrand NCC-68723 Destroyed at the Battle of Wolf 359. USS Mesquite NCC-1709-A Training ship, assigned to Star Base 001. mentioned in Star Trek: Tactical Assault. USS Challenger NCC-71099 Witnesses the return of USS Voyager to Earth. Commanded by Captain Geordi La Forge in an alternate future. USS Dauntless NCC-71879 First ship under players command in Star Trek: Bridge Commander. Destroyed while escorting a transport by Cardassian ships. USS Enterprise NCC-1701-D Primary setting for Star Trek: The Next Generation. Captained by Jean-Luc Picard. Launched in 2363. Destroyed in 2371. Engineering section destroyed by warp core breach at Veridian III. Saucer section crash landed on Veridian III and rendered unsalvageable. USS Excalibur NCC-26517-A Commanded by Captain Mackenzie Calhoun, primary setting for the latter part of Star Trek: New Frontier as successor to the Ambassador class ship of the same name. USS Galaxy NCC-70637 (NX-70637) Pathfinder. Participates in the Battle for Deep Space 9, First Battle of Chin'toka, and Battle of Cardassia. Part of Battle Group Omega sent to intercept Reman warship Scimitar. USS London NCC-2012-C Participates in the Battle for Deep Space 9. USS Musashi NCC-71809 Mentioned in the conversation of log transcription for Graviton Stabilizer by Ensign Nog. USS Odyssey NCC-71832 Sent to rescue Benjamin Sisko from the Jem'Hadar. Destroyed in the rescue attempt. USS Robinson NCC-71842 Taken command of by Benjamin Sisko after the Borg Invasion of 2381 in the novel Star Trek: Typhon Pact – Rough Beasts of Empire. USS San Francisco NCC-69480 Minor supporting vessel in Star Trek: Bridge Commander. Fate uncertain. USS Trident NCC-31347 Commanded by Captain Elizabeth Shelby and later Captain Kat Mueller in Star Trek: New Frontier. USS Venture NCC-71854 Part of a Starfleet task force at Deep Space Nine during the Klingon invasion of the Cardassian Union. Participates in the Battle for Deep Space 9 and the First Battle of Chin'toka. USS Yamato NCC-71807 or NCC-1305-E Crew discovered Iconian artifacts but is infected by a computer virus that causes antimatter containment loss. The virus causes the ship to explode with all hands lost. Commanded by Captain Donald Varley. USS Galen NX-86350 Prototype, commanded by Commander Clarissa Glenn. Part of the Project Full Circle in the Star Trek: Voyager relaunch novels. USS Tripoli NCC-19386 Discovered Data. Later assigned to Qualor II. USS Liberty NX-74010 Part of Battle Group Omega sent to intercept Reman warship Scimitar. Commanded by Captain Carl S. Bouchillon. USS Pathfinder NCC-74562 Captain Christine McDonald's new command in the book Star Trek: Preserver. Destroyed in battle with USS Enterprise (NCC-1701-E) and Ferengi Marauder-class starship Leveraged Buyout around planet Halkan. USS Intrepid NCC-74600 Pathfinder vessel. Part of Battle Group Omega sent to intercept Reman warship Scimitar. USS Voyager NCC-74656 Primary setting of Star Trek: Voyager : (TV Series) . Commanded by Captain Kathryn Janeway. Commanded by Captain Chakotay in the "Enemy of My Enemy" book series, then commanded by Captain Afsarah Eden in the novel Unworthy, then by Captain Chakotay as final commander in the novels Full Circle and Children of the Storm. USS Bellerophon NCC-74705 Transports Federation personnel to a summit on Romulus. Flagship of Vice Admiral Ross during parts of the Dominion War. USS Sally Ride NCC-74710 Designed for deep space exploration and scientific discovery. It is the third ship in the Intrepid-class, having been commissioned at the same time as the USS Voyager. It has a cruising speed of warp 6 and a maximum sustainable speed of warp 9.975. Its armaments include ablative armor and quantum torpedoes. Commanded by Capt. Rafael Martinez. It appears in the Geek & Sundry web show Shield of Tomorrow. Named for the most populous city in Turkey. USS Constantinople NCC-34852 Suffered a hull breach transporting colonists to Gravesworld. USS Havana NCC-34043 Scheduled to rendezvous with the Enterprise-D in 2369. USS Sarajevo NCC-38529 Lost in the Gamma Quadrant in 2371. Later recovered and served in the Dominion War. Named for spacecraft designer Sergey Korolyov. USS Goddard NCC-59621 Delayed rendezvous with the Enterprise-D after the Acamarian Truce's signing. Part of the tachyon blockade during the Klingon Civil War. USS Korolev NCC-1650 Presumable namesake ship for the class. Featured in the Star Trek: Titan novels. USS Luna NX-80101 The prototype for the Luna-class. The ship was destroyed by a catastrophic engine failure before the events described in the novel Taking Wing of the Star Trek: Titan novel series took place. USS Titan NCC-80102 The USS Titan is the first command of Captain William Thomas Riker, former first officer of the USS Enterprise-D and USS Enterprise-E.
A Luna-class starship, designed primarily for scientific discovery. Described as 450 meters long, the Titan was built with state-of-the-art science facilities as opposed to being a more tactically pronounced starship. With a complement of about 350 persons, the USS Titan comprises the most racially diverse crew in Starfleet, with less than 15% of the population being human, as well as a number of non-humanoid beings. 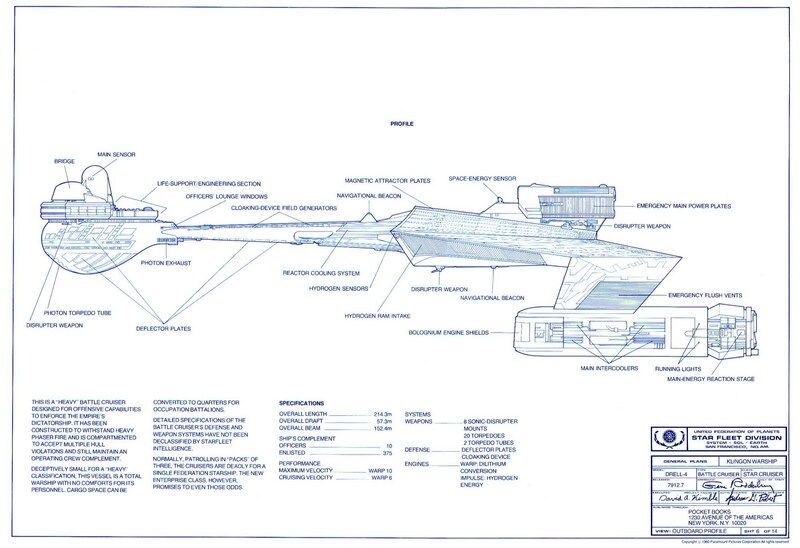 A full set of schematics of the USS Titan is available in the novel Sword of Damocles of the Star Trek: Titan novel series. USS Callisto NCC-80109 Captained by Admiral Trenton Cole, a long time friend of Picard's. USS Rhea NCC-80110 Captained by Captain Bazel, a Saurian. USS Charon NCC-80111 Captained by Bellatora Fortis and destroyed during the novel Sword of Damocles of the Star Trek: Titan novel series. USS Krakatoa NCC-80115 Captained by Bartholomew Stavisky, a long time friend of Benjamin Sisko. Last command was USS Illinois NCC-12512 States class. USS Lalo NCC-43837 Reports a "hiccup" in time that resulted from Dr. Paul Manheim's experiments. Destroyed by the Borg. USS Wyoming NCC-43730 Ship on which Tuvok served. USS Merced NCC-37120 Presumable namesake ship for the class. USS Trieste NCC-37124 Fell through a wormhole during Data's tour of duty. Stationed near Starbase 74 when the Enterprise-D is hijacked by the Bynars. USS Curie NCC-81890 Commanded by Captain Xin Chan. Part of "Project Full Circle" in the Star Trek: Voyager novel Full Circle. USS Hawking NCC-81897 Commanded by Captain Bal Itak. Part of "Project Full Circle" in the Star Trek: Voyager novel Full Circle. USS Merian Unknown Presumable namesake ship for the class. USS Planck NCC-81894 Commanded by Captain Hosc T'Mar. Part of "Project Full Circle" in the Star Trek: Voyager novel Full Circle. Named for character in play The Tempest by William Shakespeare. Also the name of a moon. USS Aephas unknown Featured in the tie-in novel Star Trek: Seekers #4: All That's Left. USS Brittain NCC-21166 Crew went insane due to loss of REM sleep. USS Helin NCC-1692 Patrolled the Romulan neutral zone. USS Lantree NCC-1837 Crew died after exposure to genetically engineered humans. Destroyed by the USS Enterprise-D.
USS Majestic NCC-31060 Destroyed at the Battle for Deep Space 9. USS Nautilus NCC-31910 Participates in the First Battle of Chin'toka. USS Reliant NCC-1864 Ship on which Pavel Chekov serves as first officer. Assigned to Project Genesis and later hijacked by Khan Noonien Singh. Destroyed by Genesis Device detonation. USS Saratoga NCC-1887 Disabled by the Whale Probe. USS Saratoga NCC-31911 Ship aboard which Benjamin Sisko serves as first officer. Destroyed at the Battle of Wolf 359. USS Saratoga NCC-31911-A Replaced previous Saratoga; little else known. USS ShirKahr NCC-31905 Destroyed in the First Battle of Chin'toka. USS Sitak NCC-1924 Destroyed at the Battle for Deep Space 9. USS Tempest (simulation ship) NCC-1852 Simulated Miranda class vessel used by Academy trainees in Star Trek: Starfleet Academy. USS Tiananmen NCC-21382 Part of the tachyon blockade during the Klingon Civil War. Went MIA while patrolling the Cardassian border during the Dominion War. Participates at the First Battle of Chin'toka. Named for the Tiananmen Square protests of 1989. USS Trial NCC-1948 Part of a Starfleet task force at Deep Space Nine during the Klingon invasion of the Cardassian Union. Participates in the Battle for Deep Space 9. USS Samuel B. Roberts NCC-2020 Part of the Starfleet task force during the final battle of the Dominion war. It was brought out of mothball status just two months before the final battle after having been extensively updated. It was badly damaged in the battle but survived. It was later decommissioned again and then scrapped after being deemed too far damaged to repair and mothball again. USS Lynx NCC-78056 The Lynx was a troop transport during the Third Klingon And Federation War. She was later destroyed in a skirmish with a couple of Klingon Birds Of Prey, with all hands lost. USS Achilles NCC-77024 Commanded by Captain Tillum Drafar. Part of "Project Full Circle" in the Star Trek: Voyager novel Full Circle. Name (in universe) denotes astronomical phenomenon and (real world) pays tribute to the Nebula Award for science fiction writing. USS Bellerephon NCC-62048 Destroyed at the Battle of Wolf 359. USS Melbourne NCC-62043 Destroyed at the Battle of Wolf 359. Remains of ship visible in aftermath of the battle in Star Trek: The Next Generation episode "The Best of Both Worlds, Part 2". Registry and name same as Excelsior class ship seen in Star Trek: Deep Space Nine pilot episode "Emissary"
USS Bonchune NCC-70915 Sent to recover the USS Prometheus. USS Endeavour NCC-71805 Part of the tachyon blockade during the Klingon Civil War. Participates at the Battle of Sector 001. USS Farragut NCC-60597 Helps recover Enterprise-D crew at Veridian III. Destroyed in the Lembatta Cluster by Klingons. USS Hera NCC-62006 Disappeared while under the command of Captain Silva La Forge with a mostly Vulcan crew of 300. USS Honshū NCC-60205 Destroyed while transporting Gul Dukat to stand trial. USS Leeds NCC-70352 Participates in the Battle for Deep Space 9. USS Lexington NCC-61832 Participates in the Battle of Sector 001. USS Merrimack NCC-61827 Transported Sarek from Legara IV to Vulcan. USS Monitor NCC-61826 Sent to the Romulan Neutral Zone in anticipation of a possible Romulan attack. USS Nebula NX-60147 Presumable namesake ship for the class. USS Phoenix NCC-65420 Carries out unauthorized attacks on Cardassian ships while under the command of Captain Benjamin Maxwell. Not specified whether she's named for the mythological bird, the American city, or humanity's first FTL-capable spacecraft. USS Prometheus NCC-71201 Used by Dr. Gideon Seyetik in his project to reignite a dead star. USS Proxima NCC-61952 Missing in the Gamma Quadrant. USS Ranger NX-31472-B Lost during the Borg invasion of 2381, the vessel was defending the planet Khitomer. USS Sutherland NCC-72015 Briefly commanded by Lieutenant Commander Data while part of the tachyon blockade during the Klingon Civil War. USS T'Kumbra NCC-62100 All-Vulcan crew challenges the Deep Space Nine crew to a game of baseball. Participated in the Dominion War. USS Ulysses NCC-66808 Studied protoplanetary masses in the Helaspont Nebula. USS Nightingale NCC-60805 Minor starship in Star Trek: Bridge Commander. Used as a search-and-rescue vessel. Fate uncertain. USS Khitomer NCC-66613 Minor starship in Star Trek: Bridge Commander. Leads a failed assault on Alioth 6. Fate uncertain. USS Berkeley NCC-64720 Minor starship in Star Trek: Bridge Commander. Originally sent to study the Vesuvi Dust Cloud but fails due to the intense radiation of the dust cloud. Attacked by a Kessok probe but survives. Fate uncertain. Named for the City of New Orleans. Designated as frigates. USS Kyushu NCC-65491 Destroyed at the Battle of Wolf 359. USS Renegade NCC-63102 Rendezvous with the Enterprise-D over Dytallix B, where Captain Tryla Scott meets with the Jean-Luc Picard to discuss an alien conspiracy to take over Starfleet. USS Rutledge NCC-57295 Ship aboard which Miles O'Brien and Benjamin Maxwell served during the Cardassian War. Participated in the counterattack against the Klingons in the Archanis sector. USS Thomas Paine NCC-65530 Rendezvous with the Enterprise-D over Dytallix B, where Captain Rixx meets with the Jean-Luc Picard to discuss an alien conspiracy to take over Starfleet. Part of the tachyon blockade during the Klingon Civil War. USS Princeton NCC-59804 Destroyed at the Battle of Wolf 359. USS Wellington NCC-28473 Ship aboard which Ro Laren served, and where she was posted before being court-martialed. Underwent a computer system upgrade by Bynar technicians at Starbase 74. USS Budapest NCC-64923 Participates in the Battle of Sector 001. USS Norway NX-62341, to NCC-62341 Presumable namesake ship for the class. USS Equinox NCC-72381 Stranded in the Delta Quadrant. Heavily damaged by USS Voyager and destroyed by self-destruct initiated by Captain Ransom. USS Everett NCC-72392 Commanded by Captain Claudia Alisov. Attached to the Department of Temporal Investigations. Appears in the Department of Temporal Investigations novels. USS Lionheart NCC-73808 Medical vessel temporarily commanded by Christine Vale in the novel Star Trek: The Fall - The Poisoned Chalice. USS Twilight NCC-74413 Starfleet Intelligence attached Science vessel temporarily commanded by Jaryd Harker MD in the novel Star Trek: Adamant. USS Nova NX-73515 Presumable namesake ship for the class. Enterprise NX-01 Lead ship. Captained by Jonathan Archer. Primary setting for Star Trek: Enterprise. Launched in 2151. Decommissioned in 2161. Columbia NX-02 Commanded by Captain Erika Hernandez. Launched in 2154 and participated in Klingon-Augment crisis. After an uncertain term of service, It was eventually lost but was later discovered Intact on a desert planet in the Gamma Quadrant. Fate of crew unknown. Challenger NX-03 Mentioned in the Star Trek: Enterprise novel The Romulan War: Beneath the Raptor's Wing. Discovery NX-04 Mentioned in the Star Trek: Enterprise novel The Romulan War: Beneath the Raptor's Wing. Atlantis NX-05 Mentioned in the Star Trek: Enterprise novel The Romulan War: Beneath the Raptor's Wing. Endeavour NX-06 Mentioned in the Star Trek: Enterprise novels The Romulan War: Beneath the Raptor's Wing and The Romulan War: To Brave the Storm. Later entered Federation Starfleet service and rebuilt into Columbia class. Intrepid NX-07 Commanded by Jason Lambert. Mentioned in the Star Trek: The Next Generation novel Indistinguishable from Magic. ISS Enterprise NX-01 The Mirror Universe counterpart of the Enterprise (NX-01). ISS Avenger NX-09 In the Mirror Universe, an Imperial Starfleet warship. Named after the rocket scientist Hermann Oberth. USS Banting (simulation ship) NCC-639 Simulated Oberth class vessel used by Academy trainees in Star Trek: Starfleet Academy. USS Biko NCC-50331 Rendezvouses with the USS Enterprise-D at Deinonychus VII. USS Bonestell NCC-31600 Destroyed in the Battle of Wolf 359. USS Cochrane NCC-59318 Ferries Admiral Norah Satie to the Enterprise-D. and Julian Bashir and Lieutenant Jadzia Dax to Deep Space Nine. USS Copernicus NCC-640 Berthed at spacedock. USS LaGrange NCC-617 Transports negotiators in the game Star Trek: Starfleet Academy. This ship is destroyed by the simulator. USS Oberth NCC-602 First ship of the class. Assigned to deep space exploration in 2293, when "Operation Retrieve" was proposed. USS Pegasus NCC-53847 Equipped with an illegal prototype cloaking device that malfunctions, causing the ship to become embedded inside an asteroid. USS Raman NCC-29487 Lost while investigating Marijne VII. SS Tsiolkovsky NCC-53911 Crew infected by the Psi 2000 virus. Destroyed in asteroid collision. USS Valiant NCC-20000 Helps recover Enterprise-D crew at Veridian III. USS Yosemite NCC-19002 Studied the plasma arc between binary stars. SS Vico NAR-18834 Research vessel that was in service with Starfleet in the mid-24th century. This ship was on loan to a civilian agency, and was given a civilian registry. Vico operated out of Starbase 514. In 2368, the Vico explored an astronomical formation known as a black cluster. Found derelict by Enterprise-D. Introduced in Star Trek Online. USS Enterprise NCC-1701-F Commanded by Captain Va'kel Shon. Participates in the second battle for Deep Space Nine as well as the final battle against the Iconians in Star Trek: Online. USS Houston NCC 97284 The Houston, commanded by Admiral D'Vak, leads the federation in an assault against the Borg Queen's Octahedron in the space around the Unicomplex. USS Odyssey NX-97000 First ship of the Odyssey-class. Commissioned at Utopia Planetia. Currently in service. USS Yorktown NCC-97005 The Yorktown fought at the battle of sol in the Iconian war, and was nearly destroyed. It was later found by Starfleet and refitted into the Yorktown subclass of the Odyssey class starships. USS Hamilton NCC-97014 The Hamilton fought in many skirmishes along the Klingon border during the Third Klingon And Federation War. She later fought in the second battle of DS9 alongside ships like the USS Enterprise. The Hamilton was a major component during the Iconion War. She was later destroyed in a ’’hur’q’’ Attack at DS9. USS Kent NCC-97165 The Kent was a ship of exploration in the early 25th Century. She later went missing during the Iconion War. Two years after she went missing, a fragment of her hull was found adrift in the Ba'Aja sector,The rest of the ship was later found in the Boreth Sector in 2429. USS Victory NCC-98003 The Victory was the Last Odyssey Class starship to be built. She was launched in late 2419 and would be used as an exploration vessel. She was named after the battleship HMS Victory. This class is sometimes erroneously named "Hope class" from an early version of the dedication plaque from the USS Pasteur. USS Nobel NCC-55012 Visited Deep Space Three to search for the missing USS Hera. Served in the Dominion War. USS Pasteur NCC-58925 Ship commanded by Beverly Picard in an alternate timeline. Destroyed by warp core breach in the Devron system. Featured in the episode "All Good Things...". First class starship; still under development; captured by Romulans and recovered by Starfleet personnel, after the EMH from USS Voyager and the EMH Mark II incapacitated the Romulan crew. USS Aries NCC-45167 Ship offered to William Riker to command. Part of the tachyon blockade during the Klingon Civil War. USS Hornet NCC-45231 Part of the tachyon blockade during the Klingon Civil War. Named for the World War II aircraft carrier. Participates in the Dominion War. USS Maryland NCC-45109 Missing in the Gamma Quadrant. USS Renaissance NCC-40521 Presumable namesake ship for the class. Named for the star Rigel. USS Akagi NCC-62158 Part of the tachyon blockade during the Klingon Civil War. Served in the Dominion War. Named for HIJMS Akagi. USS Rigel NCC-62000 Presumable namesake ship for the class. USS Tolstoy NCC-62095 Destroyed in the Battle of Wolf 359. USS da Vinci NCC-81623 Lead ship in Starfleet Corps of Engineers novel series. Named for Leonardo da Vinci. USS Endurance NCC-70114 Mentioned as replacement ship for Captain Christine McDonald in the book Star Trek: Preserver. USS Falchion Unknown Featured in the novel Star Trek: The Fall – A Ceremony of Losses. USS Marco Polo Unknown Commanded by Deanna Troi during the Gateways crisis in the novel Star Trek: The Next Generation – Gateways: Doors Into Chaos. USS Musgrave Unknown Featured in the novel Star Trek – A Singular Destiny. USS Saber NCC-79221 Presumable namesake ship for the class. USS Yeager NCC-61947 Participates in the Battle of Sector 001. USS Sequoia NCC-70070 Presumable namesake ship for the class. USS Yellowstone NCC-70073 Transports Ensign Melora Pazlar to Deep Space Nine in 2370. USS Atlas NCC-82745 Commanded by Morgan Bateson in the 2380s. USS Bozeman NCC-1941-A Successor to the first Bozeman. Participated in the Battle of Sector 001. USS Enterprise NCC-1701-E Primary setting for Star Trek: First Contact, Star Trek: Insurrection, and Star Trek Nemesis and made an Appearance on Bridge Commander Captained by Jean-Luc Picard. USS First Minister Unknown Mentioned in the novel Star Trek: Typhon Pact – Plagues of Night. USS Gibraltar NCC-75689 Sacrificed itself against the Borg in 2381 in Star Trek: Destiny. USS President Unknown Mentioned in the novel Star Trek: Typhon Pact – Plagues of Night. USS Sovereign NX-73811 - NCC-73811 First ship of the class which acts as a pathfinder ship. Appears in Star Trek Bridge Commander. Also features in the Shatnerverse novel Spectre. USS Tempest Unknown Participates in the Borg Invasion of 2381 in Star Trek: Destiny. USS Warspite Unknown Appears in the novel Star Trek: The Fall – A Ceremony of Losses. USS Bozeman NCC-1941 Spends several decades caught in a temporal causality loop; Commanded by Captain Morgan Bateson (Kelsey Grammer). Named for Bozeman, Montana, launching place of humanity's first warp ship and hometown of Brannon Braga, the writer of the episode that the ship appeared in. The registration number was a reference to the 1979 film 1941 due to modelmaker Greg Jein working on both projects. USS Soyuz NCC-1939 Presumable namesake ship for the class. USS Chekov NCC-57302 Destroyed in the Battle of Wolf 359. USS Springfield NCC-53500 Presumable namesake ship for the class. NX-326 Former United Earth Military Assault Command Operations ship relaunched in the 2160s shortly after the formation of the United Federation of Planets under the command of Balthazar Edison. One of the first ships capable of achieving Warp 4. Lost in the Gagarin Radiation Belt. Recovered by James T. Kirk and the survivors of USS Enterprise in 2263 and returned to Starbase Yorktown. USS Appalachia NCC-52136 Participates in the Battle of Sector 001. USS Steamrunner NX-76220 to NCC-76220 Presumable namesake ship for the class. Named for Vulcan philosopher Surak. USS Surak NCC-65601 Presumable namesake ship for the class. USS Zapata NCC-33184 Scheduled to rendezvous with the Enterprise-D. Fought in the Dominion War. USS Nash NCC-20105 Transports personnel to and from Deep Space Nine. USS Sydney NCC-2005 Presumable namesake ship for the class. USS Demeter NCC-79914 Commanded by Liam O'Donnell. Part of "Project Full Circle" in the Star Trek: Voyager relaunch novels. USS Theophrastus Unknown Presumable namesake ship for the class, and possibly named after the Swiss chemist Philippus Aureolus Theophrastus Bombastus von Hohenheim, also known as Paracelsus. USS Enterprise NCC-1701-J Participates in a decisive battle against the Sphere Builders in the 26th century. Reference image page 244 The Star Trek Encyclopedia for class identification (2016 edition). Introduced in Star Trek: Destiny and first visualized in Star Trek Online. USS Aventine NCC-82602 First command of Captain Ezri Dax in Star Trek: Destiny. Has prototype slipstream warp drive. USS Capitoline NCC-82617 Attached to the Department of Temporal Investigations. Mentioned in the Department of Temporal Investigations novels. USS Esquiline NCC-82614 Commanded by Captain Parimon Dasht. Part of "Project Full Circle" in the Star Trek: Voyager novel Full Circle. Destroyed by the Omega Continuum in 2381 in The Eternal Tide. USS Quirinal NCC-82610 Commanded by Captain Regina Farkas. Part of "Project Full Circle" in the Star Trek: Voyager novel Full Circle. Destroyed by the Omega Continuum in 2381 in The Eternal Tide. USS Vesta NCC-82601 Commanded by Captain Regina Farkas. Lead ship of the Vesta class. Mothballed soon after launch due to technical issues. Relaunched and becomes part of Project Full Circle in 2381 in the Star Trek: Voyager novel Protectors. The class was named for NASA test pilot Joe Walker. USS Shenzhou NCC-1227 Commanded by Captain Philippa Georgiou. First Officer was Lieutenant Commander Michael Burnham. As a result of the Battle at the Binary Stars in 2256, the crew evacuated the ship, leaving it abandoned. USS Walker NCC-1226 Presumable namesake ship for the class. USS Drake NCC-20381 Command offered to William Riker, but given to Paul Rice. Ordered to investigate the Lorenze Cluster where it is destroyed by a Minosian Echo Papa 607 weapons platform. USS Fleming NCC-20316 Disabled and later destroyed at the Hekaras Corridor. USS Wambundu NCC-20300 Presumable namesake ship for the class. Named in honor of science fiction author H. G. Wells. USS Pastak NCV-474438-G Timeship that saves the character from a Tholian attack in Star Trek Online. USS Relativity NGV-474439-G Timeship Relativity, from the 29th century, ship designed to transport people through time, set on a mission to prevent the destruction of the USS Voyager. USS Wells NGV-474438-A Presumable namesake ship for the class. USS Denver NCC-54927 Destroyed while transporting 517 colonists to the Beloti Sector. USS Yorkshire NCC-54900 Presumable namesake ship for the class. USS Yorktown NCC-61137 Ordered to make long-range sensor sweeps of the Devron system in an alternate reality. USS Zodiac NCC-61000 Presumable namesake ship for the class. Phoenix unknown Earth spaceship used in the 21st century. It was the first Earth-made, manned spacecraft to achieve light speed using warp drive. It was practically a "junk-bucket, mounted on top of an atomic war missile". The Phoenix is remembered as the ship that instigated Earth's first contact with Vulcans. Featured in Star Trek: First Contact and flown by Dr. Zefram Cochrane, Commander William Riker, and Lt. Commander Geordi La Forge. USS Buran Unknown The ship was ambushed by Klingons about a month after the beginning of the 2256 Federation-Klingon war and apparently destroyed. Its captain at the time was Gabriel Lorca. At some point Lorca was replaced by his mirror-universe counterpart, who impersonated him and reported that ship was boarded, then set to self destruct by him so that its crew doesn't fall into Klingon hands and face degradation, torture and slow public death. USS Olympia Unknown Crashed on an L class planet during an exploration of the mission to the Beta quadrant. Captained by Lisa Cusack. USS Raven NAR-32450 Science and exploration vessel used by the Hansens for exploration of Delta Quadrant where Seven of Nine was assimilated by the Borg. USS Tombaugh Unknown Mentioned by Seven of Nine in a log under personality of Ensign Stone. Under the command of Captain Blackwood. Assimilated by the Borg. USS Danube NX-72003 First ship of the class. Mentioned in Star Trek: Deep Space Nine Technical Manual. USS Gander NCC-73624 Taken by Ezri Dax to search for Worf. Destroyed by the Jem'Hadar. USS Ganges NCC-72454 Captured Tahna Los. Rescued Vash from the Gamma Quadrant. Destroyed by a T'Lani Munitions Cruiser. USS Mekong NCC-72617 Helps rescue Benjamin Sisko from the Jem'Hadar. Destroyed by the Jem'Hadar during the Obsidian Order/Tal Shiar attack on the Founders' homeworld in the Omarian Nebula. USS Orinoco NCC-72905 Helps rescue Benjamin Sisko from the Jem'Hadar. Destroyed by the Cardassian terrorist group The True Way. USS Rubicon NCC-72936 Shrunk to 6.5 centimeters. USS Shenandoah NCC-73024 Taken by Dax and Worf to rescue a Cardassian informant from the Dominion. Severely damaged by the Jem'Hadar en route to deliver diplomatic message to Grand Nagus Zek. USS Volga NCC-73196 Participates in botanical survey of Torad IV. USS Yangtzee Kiang NCC-72453 Hijacked by Bajoran terrorist Tahna Los. Became the first DS9 runabout to be destroyed when it crashed on a moon in the Gamma Quadrant. USS Yolja NCC-75353 First runabout to be named after a non-Earth river. Assigned to Deep Space 9. Appeared in Worlds of Star Trek: Deep Space Nine, Volume Three – The Dominion: Olympus Descending. USS Yukon NCC-74602 Stolen by Founder in failed attempt to destroy the Bajoran sun. Destroyed by a Protomatter Device also killing a Founder. Flurnoy unknown Used by the Maquis. Participated in the Dominion War. USS Yellowstone NX-74751 Prototype for an advanced runabout designed in large part by Ensign Harry Kim and Lieutenant Laska in an alternate timeline. Destroyed by antimatter containment loss. Aeroshuttle unknown Upgraded shuttle attached to Intrepid-class starships. Calypso USS Enterprise-D Captain's yacht. Columbus USS Enterprise Shuttle NCC-1701/2, dispatched to search the planet Taurus II from orbit for the Shuttlecraft Galileo. Copernicus USS Enterprise-A Shuttle NCC-1701-A/3, used to transport Kirk, Spock, McCoy, and Sybok to the planet "Eden". Cousteau USS Enterprise-E Captain's yacht. Curie USS Enterprise-D Shuttle taken by Worf to the Bat'leth tournament. Dawkins unknown Shuttlecraft on which Reginald Barclay arrives on Jupiter Station. Delta Flyer USS Voyager Advanced shuttlecraft. First one destroyed. Second built. Einstein USS Enterprise-D Shuttle 02 that carries Captain Picard and Wesley Crusher to Starbase 515. El-Baz USS Enterprise-D Shuttle 05 carrying Captain Picard from the future. Fermi USS Enterprise-D Suffers a transporter accident. Galileo USS Enterprise Shuttle NCC-1701/7 (named after Galileo Galilei), which burned up in the atmosphere over the planet Taurus II. second Galileo USS Enterprise Second shuttle with the identification NCC-1701/7, used to ferry Ambassador Sarek and his wife Amanda (Mr. Spock's parents) to the USS Enterprise, temporarily disabled while being used to transport Commissioner Hedford, Spock, Kirk, and Dr. McCoy to the USS Enterprise after being hijacked by an energy field (the "Companion"), and used by Spock to examine a large, energy-draining space creature. Galileo II USS Enterprise Third shuttle with the identification NCC-1701/7, temporarily stolen by Dr. Sevrin and his followers to visit the planet "Eden". new Galileo USS Enterprise-A Shuttle NCC-1701-A/5, used for transport to/from Nimbus III; severely-damaged during manual shipboard landing. Gilliam unknown Shuttle that takes Dr. McCoy and Kirk to the Enterprise. Goddard USS Enterprise-D Shuttle given to Captain Scott on an "extended loan". Hawking USS Enterprise-D Shuttle piloted by Commander Riker carrying Ambassador Odan. Jumpship unknown A small atmospheric shuttlecraft that could be operated by a single pilot. Jumpships were used by Starfleet as emergency evacuation craft in the late 2250s of the alternate reality. Justman USS Enterprise-D Testbed for Dr. Rega's Metaphasic Shield. Named for Star Trek production executive Robert Justman. Magellan USS Enterprise-D Shuttle piloted by Commander Riker researching Null Space. Onizuka USS Enterprise-D Shuttle used by Geordi La Forge to go to Risa when he was kidnapped by the Romulans. Named after astronaut Ellison Onizuka. Picasso Starbase 11 Shuttle SB11-1201/1, in which Kirk chased the USS Enterprise while on its way to the forbidden planet Talos IV. Pike USS Enterprise-D Unnumbered shuttlecraft used by Data to transport hitridium. Destroyed. Sakharov USS Enterprise-D Shuttlecraft 01 used for an experiment with the genetically engineered children. SC-4 unknown Armored shuttle taking Admiral Janeway to the past. Waverider USS Equinox Upgraded atmospheric shuttle. Shuttlecraft Cochrane USS Voyager Testbed for Warp 10 flight piloted by Tom Paris. Closely resembles the later hull design for Delta Flyer. Destroyed attempting to retrieve Warp Core. Einstein USS Enterprise Shuttle NCC-1701/6, destroyed after Commodore Decker stole it and made a kamikaze run against an alien planet killer. Canterbury USS Hamilton Destroyed when the Hamilton rammed into a Borg Cube in Fluidic Space. ^ a b c d e f g h i j k l m n o p q r s t u Okuda, Michael & Okuda, Denise (1994–1999). The Star Trek Encyclopedia. New York: Pocket Books. ISBN 978-0-671-03475-7. ^ a b c d e f g h i Star Trek: First Contact. November 22, 1996. ^ a b c "Tribunal". Star Trek: Deep Space Nine. ^ "Tin Man". Star Trek: The Next Generation. ^ "Yesterday's Enterprise". Star Trek: The Next Generation. ^ a b c d e f g h i j k l m n o "Redemption, *Part II". Star Trek: The Next Generation. ^ a b c "Non Sequitur". Star Trek: Voyager. UPN. ^ "You Are Cordially Invited...". Star Trek: Deep Space Nine. ^ "Second Chances". Star Trek: The Next Generation. ^ "Defiant". Star Trek: Deep Space Nine. ^ a b c d "Conspiracy". Star Trek: The Next Generation. ^ a b c d e f g "Emissary". Star Trek: Deep Space Nine. ^ "Data's Day". Star Trek: The Next Generation. ^ "Hollow Pursuits". Star Trek: The Next Generation. ^ "Apocalypse Rising". Star Trek: Deep Space Nine. ^ "Charlie X". Star Trek. NBC. In Star Trek: The Motion Picture, NCC-501 is also referred to as "Columbia" (this takes place right before V'Ger attacks the outpost). ^ a b c "Descent, Part I". Star Trek: The Next Generation. ^ "Tapestry". Star Trek: The Next Generation. ^ a b "Where No One Has Gone Before". Star Trek: The Next Generation. ^ a b "Lower Decks". Star Trek: The Next Generation. ^ a b c d e f g h i j k "The Best of Both Worlds, Part II". Star Trek: The Next Generation. ^ a b "Ménage à Troi". Star Trek: The Next Generation. ^ a b "Brothers". Star Trek: The Next Generation. ^ Dibdin, Emma (May 8, 2013). "'Star Trek Into Darkness': 10 teasers for JJ Abrams sequel - Spoilers". Digital Spy. Archived from the original on December 13, 2013. Retrieved May 24, 2013. ^ a b "A Time to Stand". Star Trek: Deep Space Nine. ^ "Firstborn". Star Trek: The Next Generation. ^ a b "The Die is Cast". Star Trek: Deep Space Nine. ^ "Night". Star Trek: Voyager. ^ "The Abandoned". Star Trek: Deep Space Nine. ^ a b "Waltz". Star Trek: Deep Space Nine. ^ "Too Short a Season". Star Trek: The Next Generation. ^ a b c "Treachery, Faith, and the Great River". Star Trek: Deep Space Nine. ^ "Peak Performance". Star Trek: The Next Generation. ^ a b c "Favor the Bold". Star Trek: Deep Space Nine. ^ a b "The Battle". Star Trek: The Next Generation. ^ "Elementary, Dear Data". Star Trek: The Next Generation. ^ "Identity Crisis". Star Trek: The Next Generation. ^ a b c d e f "In the Pale Moonlight". Star Trek: Deep Space Nine. ^ "The Doomsday Machine". Star Trek. October 20, 1967. NBC. ^ "The Tholian Web". Star Trek. November 15, 1968. NBC. ^ "In a Mirror, Darkly, Part I". Star Trek: Enterprise. April 22, 2005. UPN. ^ "Mirror, Mirror". Star Trek. October 6, 1967. NBC. ^ a b c d Star Trek III: The Search for Spock. Paramount Pictures. June 1, 1984. ^ a b c Star Trek (film). Paramount Pictures. May 8, 2009. ^ a b c d "The Ultimate Computer". Star Trek. March 8, 1968. NBC. ^ "The Omega Glory". Star Trek. March 1, 1968. NBC. ^ a b "Obsession". Star Trek. December 15, 1967. NBC. ^ "The Immunity Syndrome". Star Trek. January 19, 1968. NBC. ^ a b c d e Star Trek VI: The Undiscovered Country. Paramount Pictures. December 6, 1991. ^ a b c d e Star Trek: The Motion Picture. Paramount Pictures. December 7, 1979. ^ Star Trek II: The Wrath of Khan. ^ Star Trek III: The Search for Spock. ^ Star Trek IV: The Voyage Home. ^ "Context is for Kings". Star Trek: Discovery. October 1, 2017. ^ "The Return of the Archons". Star Trek. February 9, 1967. NBC. ^ "Friday's Child". Star Trek. December 8, 1967. NBC. ^ "Power Play". Star Trek: The Next Generation. February 24, 1992. ^ "The Search". Star Trek: Deep Space Nine. ^ "The Changing Face of Evil". Star Trek: Deep Space Nine. ^ a b "The Dogs of War". Star Trek: Deep Space Nine. ^ a b c "What You Leave Behind". Star Trek: Deep Space Nine. ^ a b "Valiant". Star Trek: Deep Space Nine. ^ "Legacy". Star Trek: The Next Generation. ^ "Reunion". Star Trek: The Next Generation. ^ "Exclusive Interview: Roberto Orci On All The Latest With Star Trek (and more)". TrekMovie.com. Retrieved October 4, 2014. ^ a b "Paradise". Star Trek: Deep Space Nine. ^ "Caretaker". Star Trek: Voyager. January 16, 1995. UPN. ^ "Shattered". Star Trek: Voyager. January 17, 2001. UPN. ^ "Angel One". Star Trek: The Next Generation. ^ "Chain of Command, Part I". Star Trek: The Next Generation. ^ "The Neutral Zone". Star Trek: The Next Generation. ^ a b "The Pegasus". Star Trek: The Next Generation. ^ Ritual Entertainment. Star Trek: Elite Force II. ^ a b c Star Trek Generations. Paramount Pictures. November 18, 1994. ^ a b c "Flashback". Star Trek: Voyager. September 11, 1996. UPN. ^ "Statistical Probabilities". Star Trek: Deep Space Nine. ^ "Chrysalis". Star Trek: Deep Space Nine. ^ a b "Relativity". Star Trek: Voyager. UPN. ^ a b "The Most Toys". Star Trek: The Next Generation. ^ "Field of Fire". Star Trek: Deep Space Nine. ^ "Encounter at Farpoint, Part I". Star Trek: The Next Generation. ^ a b c d e f g h i "Sacrifice of Angels". Star Trek: Deep Space Nine. ^ a b c d e f g "Tears of the Prophets". Star Trek: Deep Space Nine. ^ a b c d e Star Trek Nemesis. Paramount Pictures. December 13, 2002. ^ "Sins of the Father". Star Trek: The Next Generation. ^ "Paradise Lost". Star Trek: Deep Space Nine. ^ "For the Uniform". Star Trek: Deep Space Nine. ^ "Homefront". Star Trek: Deep Space Nine. ^ a b c "Unnatural Selection". Star Trek: The Next Generation. ^ "Unity". Star Trek: Voyager. ^ a b c d "All Good Things... (Star Trek: The Next Generation)". Star Trek: The Next Generation. ^ "Endgame". Star Trek: Voyager. ^ "Timeless". Star Trek: Voyager. UPN. ^ "Favor the Bold". Star Trek: Deep Space Nine. ^ "Far Beyond the Stars". Star Trek: Deep Space Nine. ^ a b c d "The Jem'Hadar". Star Trek: Deep Space Nine. ^ a b "The Way of the Warrior, Part II". Star Trek: Deep Space Nine. ^ "Where Silence Has Lease". Star Trek: The Next Generation. ^ "Contagion". Star Trek: The Next Generation. ^ "Datalore". Star Trek: The Next Generation. ^ "Unification, Part I". Star Trek: The Next Generation. ^ a b "Inter Arma Enim Silent Leges". Star Trek: Deep Space Nine. ^ "The Schizoid Man". Star Trek: The Next Generation. ^ "Lessons". Star Trek: The Next Generation. ^ a b c "In Purgatory's Shadow". Star Trek: Deep Space Nine. ^ "The Vengeance Factor". Star Trek: The Next Generation. ^ "We'll Always Have Paris". Star Trek: The Next Generation. ^ "The Best of Both Worlds, Part I". Star Trek: The Next Generation. ^ "Clues". Star Trek: The Next Generation. ^ a b "11001001". Star Trek: The Next Generation. ^ "Night Terrors". Star Trek: The Next Generation. ^ a b c Star Trek II: The Wrath of Khan. Paramount Pictures. June 4, 1982. ^ "In the Cards". Star Trek: Deep Space Nine. ^ Bernd Schneider (January 11, 2018). "Proto-Nebula Class Reconstruction". Ex Astris Scientia. Retrieved January 16, 2019. ^ a b "Message in a Bottle". Star Trek: Voyager. January 14, 1998. UPN. ^ a b "...Nor the Battle to the Strong". Star Trek: Deep Space Nine. ^ a b c "Interface". Star Trek: The Next Generation. ^ "Sarek". Star Trek: The Next Generation. ^ "The Defector". Star Trek: The Next Generation. ^ a b "The Wounded". Star Trek: The Next Generation. ^ "Second Sight". Star Trek: Deep Space Nine. ^ "Take Me Out to the Holosuite". Star Trek: Deep Space Nine. ^ "The Adversary". Star Trek: Deep Space Nine. ^ "Tribunal". Star Trek: Deep Space Nine. ^ "Ensign Ro". Star Trek: The Next Generation. ^ a b c "Equinox". Star Trek: Voyager. UPN. ^ "Endgame". Star Trek: Voyager. UPN. ^ a b "Affliction". Star Trek: Enterprise. UPN. ^ a b "In a Mirror, Darkly, Part 1". Star Trek: Enterprise. ^ "A Fistful of Datas". Star Trek: The Next Generation. ^ "The Drumhead". Star Trek: The Next Generation. ^ "The Naked Now". Star Trek: The Next Generation. ^ "Realm of Fear". Star Trek: The Next Generation. ^ a b "Frame of Mind". Star Trek: The Next Generation. ^ "Hero Worship". Star Trek: The Next Generation. ^ "The Icarus Factor". Star Trek: The Next Generation. ^ "Melora". Star Trek: Deep Space Nine. ^ T'Pol confirms this to Hoshi Sato as the Vulcans' reason for first landing there on April 5, 2063 in Star Trek: Enterprise episode "Desert Crossing"
^ "Cause and Effect". Star Trek: The Next Generation. ^ a b "Relics". Star Trek: The Next Generation. ^ "Playing God". Star Trek: Deep Space Nine. ^ "Azati Prime". Star Trek: Enterprise. UPN. ^ a b "The Arsenal of Freedom". Star Trek: The Next Generation. ^ "Force of Nature". Star Trek: The Next Generation. ^ "Ethics". Star Trek: The Next Generation. ^ "Choose Your Pain". Star Trek: Discovery. ^ "The War Without, The War Within". Star Trek: Discovery. ^ "Inside Man". Star Trek: Deep Space Nine. ^ "Terra Nova". Star Trek: Enterprise. ^ "A Time to Stand". Star Trek: Deep Space Nine. ^ "Survival Instinct". Star Trek: Voyager. UPN. ^ a b c d "Whispers". Star Trek: Deep Space Nine. ^ "The Sound of Her Voice". Star Trek: Deep Space Nine. ^ "The Raven". Star Trek: Voyager. ^ "Infinite Regress". Star Trek: Voyager. ^ "The Siege of AR-558". Star Trek: Deep Space Nine. ^ "Future's End Pt.1". Star Trek: Voyager. ^ "Afterimage". Star Trek: Deep Space Nine. ^ a b "Penumbra". Star Trek: Deep Space Nine. ^ a b "Past Prologue". Star Trek: Deep Space Nine. ^ "Q-Less". Star Trek: Deep Space Nine. ^ "Armageddon Game". Star Trek: Deep Space Nine. ^ "Our Man Bashir". Star Trek: Deep Space Nine. ^ "One Little Ship". Star Trek: Deep Space Nine. ^ "Change of Heart". Star Trek: Deep Space Nine. ^ "Body Parts". Star Trek: Deep Space Nine. ^ "Battle Lines". Star Trek: Deep Space Nine. ^ "By Inferno's Light". Star Trek: Deep Space Nine. ^ "The Maquis, Part II". Star Trek: Deep Space Nine. ^ "Future Tense". Star Trek: Enterprise. UPN. ^ Okuda, Michael & Rick Sternbach (1991). Star Trek: The Next Generation Technical Manual. New York: Pocket Books. ISBN 978-0-671-70427-8. ^ a b "The Galileo Seven". Star Trek: The Original Series. ^ a b Star Trek V: The Final Frontier. ^ "Parallels". Star Trek: The Next Generation. ^ "Life Line". Star Trek: Voyager. UPN. ^ "Unimatrix Zero". Star Trek: Voyager. UPN. ^ "Drive". Star Trek: Voyager. UPN. ^ "Samartian Snare". Star Trek: The Next Generation. ^ "Time Squared". Star Trek: The Next Generation. ^ "Rascals". Star Trek: The Next Generation. ^ "Journey to Babel". Star Trek: The Original Series. ^ "Metamorphosis". Star Trek: The Original Series. ^ "The Immunity Syndrome". Star Trek: The Original Series. ^ "The Way to Eden". Star Trek: The Original Series. ^ "The Host". Star Trek: The Next Generation. ^ "Suspicions". Star Trek: The Next Generation. ^ "The Outcast". Star Trek: The Next Generation. ^ "The Mind's Eye". Star Trek: The Next Generation. ^ "The Menagerie: Part One". Star Trek: The Original Series. ^ "Threshold". Star Trek: Voyager. UPN. ^ "Day of Honor". Star Trek: Voyager. ^ "The Doomsday Machine". Star Trek: The Original Series.